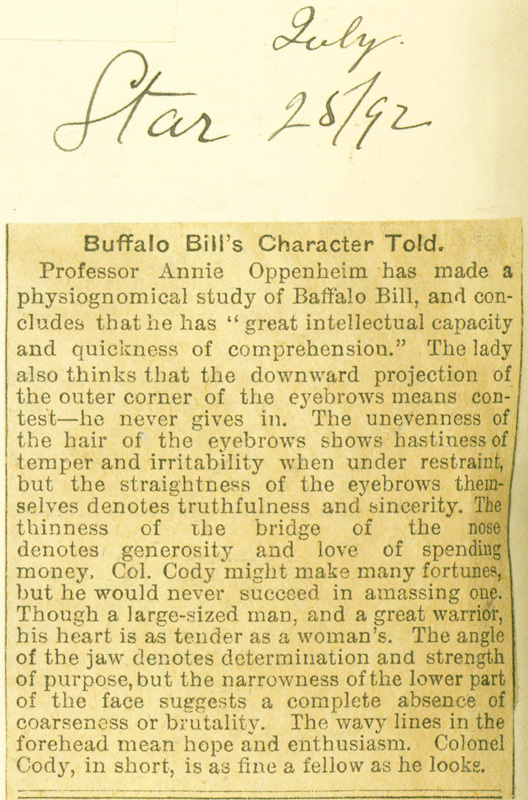 Professor Annie Oppenheim has made a physiognomical study of Baffalo Bill, and concludes that he has "great intellectual capacity and quickness of comprehension." 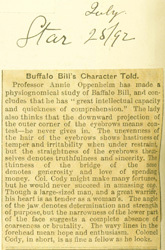 The lady also thinks that the downward projection of the outer corner of the eyebrows means contest—he never gives in. The unevenness of the hair of the eyebrows shows hastiness of temper and irritability when under restraint, but the straightness of the eyebrows themselves denotes truthfulness and sincerity. The thinness of the bridge of the nose denotes generosity and love of spending money. Col. Cody might make many fortunes, but he would never succeed in amassing one. Though a large-sized man, and a great warrior, his heart is as tender as a woman's. The angle of the jaw denotes determination and strength of purpose, but the narrowness of the lower part of the face suggests a complete absence of coarseness or brutality. The wavy lines in the forehead mean hope and enthusiasm. Colonel Cody, in short, is as fine a fellow as he looks.